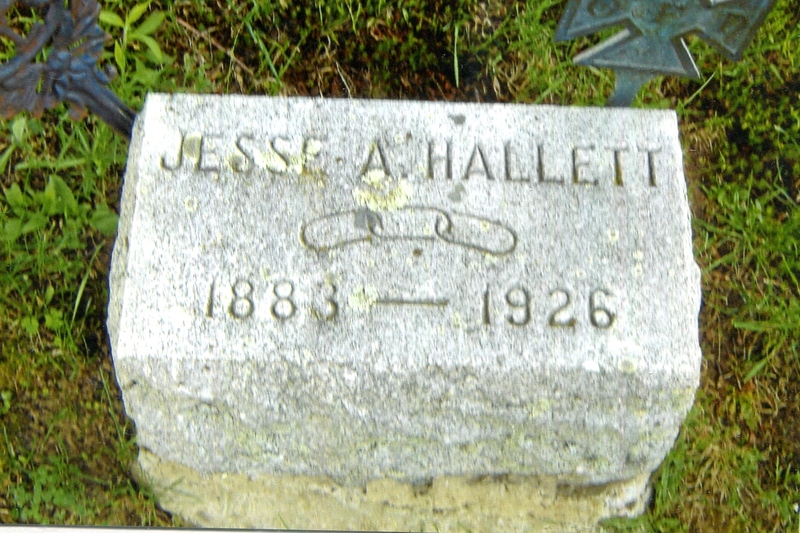 Jesse A. Hallett died at his home on Main street Sunday morning at 1 o’clock at the age of forty two years. He had been in poor health for some time and the past yer had failed fast, owing partially to worry over the health of his brother, Fred, who is seriously ill at his home on Main street. Mr. Hallett was born in Oakland Nov. 26, 1883, the son of Elias and Maria (Davis) Hallett. He had always resided in Oakland and attended the public schools here. In 1908 he was united in marriage to Jennie May Higgins of Newport. For eighteen years he had been connected with the Maine Central railroad. 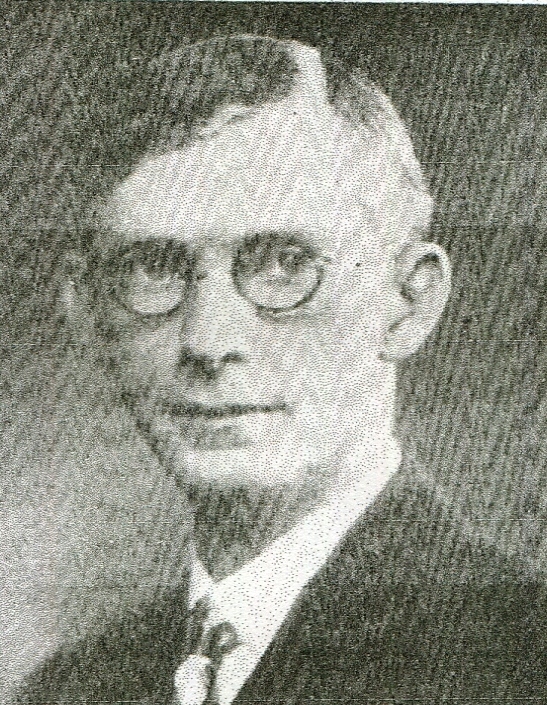 He was prominent in civil and social affairs in the town, and was a charter member of the J. Wesley Gilman Camp, Sons of Veterans, in which order he had held many offices. At the time of his death he was division commander of the Sons of Veterans of Maine and had held other division offices so that he was well known and liked throughout the state. He was also a member of Amon lodge of Odd Fellows, Acme Rebekah lodge, Hiram encampment of Waterville, Modern Woodmen of America and the Waterville Military band. He was an active and devoted member of All Souls Universalist church and belonged to the Men’s club of the church. Besides his wife, he is survived by two brothers, Fred Hallett of Bath, who is ill at the home on Main street in Oakland and George Hallett of Hallowell, four nephews, Gerald, Harold, and Ronald Hallett of Oakland and Russel of Connecticut; and tow nieces, Rachel Hallett of Oakland and Mrs. Clare Spofford of Portland. Funeral services will be conducted in the Murray vestry of the Universalist church on Tuesday at 2 o’clock, the Rev. Stanley Manning of August, officiating. Burial will be in Lakeview Cemetery. Oakland, Aug. 31 – A double funeral will be held here tomorrow morning for the two Hallett brothers, Jesse A., and Fred A., whose deaths occurred within 24 hours of each other. Fred A. Hallett, who died yesterday morning, was chief clerk of the Maine Central Railroad at Bath. He was born in Oakland June 17, 1881, and received his education in Oakland schools. In 1907 he married Miss Effie Higgins of Newport who died in 1915. Upon her death he and his four children made their home here with his brother Jesse. Two years ago he was transferred to Bath while the children continued to reside in Oakland with their uncle. Mr. Hallett was seized with erysipelas about three years ago, but continued in his work until a few days ago when he was sent to the hospital. The brothers had been very close in their relations, and their illness is said to have worried them so much that their deaths were undoubtedly hastened. Mr. Hallett served as commander of J. Wesley Gilman Camp, Sons of Veterans. He was a member of the Modern Woodmen of America, Commercial club of Bath, and the Railway Clerk’s Association. At Bath he participated in the activities of the TLW Hyde Camp. He is survived by three sons, Gerald, Harold, and Ronald, and one daughter, Rachel, and a nephew, Russell, of Connecticut, and two nieces, one being Mrs. Clare Spofford of Portland. Jesse A. Hallett, who died Sunday as announced in yesterday’s dispatches, was Maine division commander of the Union Veterans sons, formerly of the Sons of Veterans. He was born here Nov. 26, 1883. He had been commander of the local camp and belonged to Amon lodge, I.O.O.F., Acme Rebekah lodge, Hiram Encampment, Modern Woodmen, All Soul’s Universalist church, and to the Waterville Military band. Besides his wife who was Miss Jennie May Higgins of Newport, one brother, George Hallett of Hallowell, survives, and the nieces and nephews previously mentioned. The two brothers were sons of the late Elias Hallett, a well-known Civil war veteran, and Maria Davis Hallett. Because of Mr. Hallett’s death, a big patriotic rally planned for Sept. 11 in Bath has been postponed, and festivities of the Union Veterans and Ladies’ Auxiliaries throughout the State this week have been cancelled.